Shuichi Toriga, a junior high school student with a knack for electronics repair and an interest in UFOs, has met the girl of his dreams. Manami has the voice of an angel--or, at least, the voice of a distant race! After attracting the attention of some friendly aliens, Manami will rely on Shuichi's help to uncover whatever mysteries lie hidden behind the stars and inside her CD player. This must be a match made in heaven, or at least in a different galaxy! 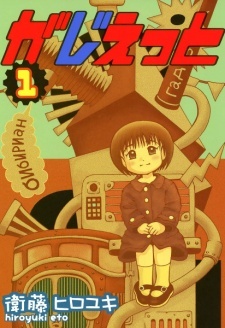 Gadget had one volume published in English by ADV Manga on November 23, 2004 before the license was dropped and the publisher went defunct.